Dignitaries in attendance at the ribbon-cutting for the Margery E. Yuill Cancer Centre at Medicine Hat Regional Hospital included, from left: Nancy Guebert, Chief Program Officer, Cancer ControlAlberta; Health Minister Sarah Hoffman; MLA Bob Wanner; Jill Forsyth, Director, Cancer Care Teams Community Oncology South, Cancer Control Alberta; Centre Manager Dan Thomas; and cancer survivor Annabel Maroquin. 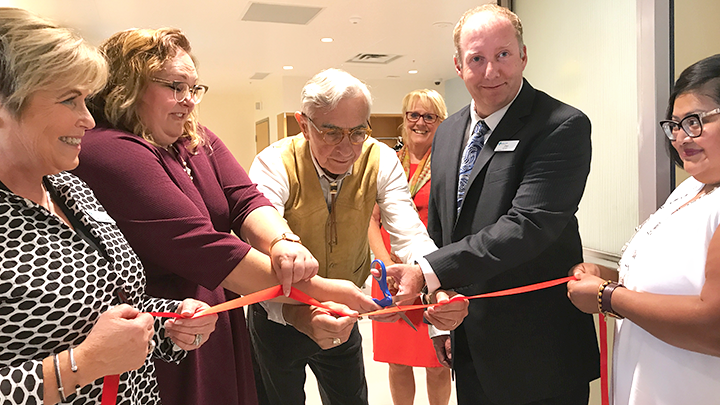 MEDICINE HAT — The community celebrated a boost in cancer care in 2018 with the official opening of the expanded Margery E. Yuill Cancer Centre at Medicine Hat Regional Hospital. The centre is designed to deliver comprehensive cancer care within the community, including systemic therapy. The expansion and renovation includes 15 chemotherapy treatment spaces, eight examination rooms, two procedure rooms and a dedicated cancer pharmacy. As well, the centre features a new supportive care and symptom management space — an enhanced healing environment that includes access to natural light and a private pediatric and/or isolation room. The additional treatment spaces mean that patients living in Medicine Hat and area no longer have to travel to Calgary for treatment. This is a great convenience for patients. Cancer survivor Annabel Maroquin understands firsthand how vital it is for patients to have the support of family and friends nearby in their home community. “It’s going to be extraordinary for patients, caregivers, all the family and friends to be able to be present with anyone that’s struggling or on their journey with cancer,” says Maroquin. The cancer centre is a part of a larger expansion at the hospital, both of which were recognized and celebrated at a July 25 ribbon-cutting. The event was attended by officials from the Government of Alberta, representatives from the City of Medicine Hat and surrounding area, AHS leadership, as well as hospital staff, physicians and volunteers. The cancer centre received more than $108,000 from the Alberta Cancer Foundation and its donors, which was used to buy furnishings for corridors, waiting rooms and family-resource areas. The grand opening — truly a historic day for cancer care in Medicine Hat and in Alberta — recognized years of hard work, planning and dedication.